Animating weather graphics can be difficult, especially in a short period of time and with a limited budget. 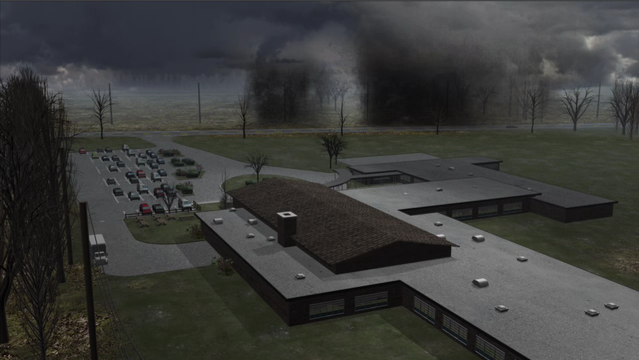 TMBA created these 3d animations and weather graphics for the Weather Channel to recreate the Coldenham disaster. The Coldenham disaster, which occurred at East Coldenham Elementary School in Newburgh, New York, claimed the lives of nine students and injured eighteen others. 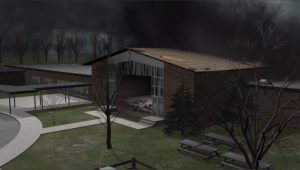 On the 16th of November, 1989, strong winds of tornado strength crashed into the wall of the cafeteria causing significant destruction. Although the event was initially recorded as a tornado, weather graphics and forensic weather analysis later showed that a downburst had occurred instead. A downburst consists of a strong horizontal downdraft that spans an area larger than 2.5 miles or 4 kilometers. The result is an outward burst of high winds near or on the surface of the ground. When considering how downbursts form, it is important to remember that they can start as smaller microbursts and grow to a much larger size. Although downbursts typically occur in conjunction with thunderstorms, this is not always the case as some downbursts occur with weaker showers. Microbursts, which are essentially concentrated downbursts, produce outward winds on the surface of the ground in a similar way to how downbursts form. These storms are typically small and of short duration, lasting anywhere from five to ten minutes with winds reaching a maximum of 168 mph. Two types of microbursts exist: wet microbursts and dry microbursts. The wet form is, as its name suggests, accompanied by significant surface precipitation whereas the dry microbursts are accompanied by a small amount of precipitation and occasionally none at all. Dry microbursts are the most common in areas such as the intermountain west and high plains. Forensic weather professionals have determined that wet microbursts, unlike dry microbursts, depend upon precipitation for their descent to the Earth's surface. Because of this, storm science indicates that the wet microbursts are far more dependent upon precipitation, predominantly hail, to occur. Dry microbursts are caused when precipitation becomes joined with dry air and starts to evaporate, cooling the surrounding air. The air then begins to descend to the surface and starts to spread, leading to a microburst. Storm science experts have determined that the occurrence of dry microbursts depends upon three factors, namely low surface relative humidity, mid-level moisture, and dry and deep adiabatic lapse rate. Those who study how microbursts form have determined that sinking air creates a centralized column that produces strong winds similar in type to a tornado and often producing equivalent damage. According to weather graphics, microbursts occur in three stages: the downburst, the outburst, and the cushion stages. Considering how microbursts form and the damage that they can inflict in a small area, aircraft are in great danger during these storms due to the size and sudden occurrence of the exceedingly high winds.